Wondering what’s a God mode? You might have heard the term “God Mode” probably in video games. If you haven’t heard about it it’s no big deal, but we all have used it in games without our knowledge. It’s a mode in games where we can boost our life. Remember the cheat code in Vice city that boosts our life when we need it most? It is known as God mode. Well this God mode is kind of different when it comes to OS. 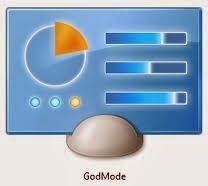 God mode provides a centralized control over your OS. Wouldn’t it be nice to get the entire OS under your control with the help of a single folder? Well God mode helps in providing you with such a feature. Actually God Mode used to be a hidden administrative shortcut. Interesting right? 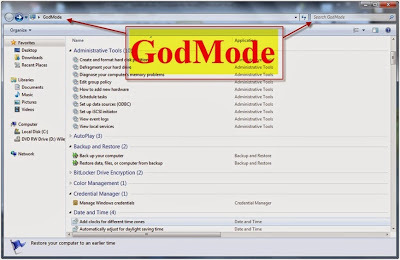 Wanna enable god mode in your Windows 7 OS or Vista? Just follow these simple steps to activate it. Enabling God mode isn’t a big and tough job. • First create a folder anywhere you like. It may be in your desktop or your C or D colon anywhere you prefer. But Desktop is quite ok.
• Now this folder of yours gets converted to a control panel icon and the numbers in it also gets disappeared. You’ll get an icon as shown. You’ll get a view as follows. Now you’ve enabled God Mode. Your process is complete. Open the panel to get a view inside. • Now all your administrative settings are arranged in a single icon. • Go and explore and change your settings as per your wish. • Some may think keeping a folder where all your settings are present is not safe. There’s no need to worry if you’ve created such a file. You can move it or delete the folder too. • There may be a question now. Should it be named only as God mode? The answer is NO. Not necessary. You can also rename it with your name but the numbers should be present. • It’s referred as God mode since it is suitable for the work it does. There are enormous amount of god modes in case of windows 7. They serve for each and every different purpose. There are different codes for biometric settings, firewall security etc. God mode enable your tasks to be less complicated. Is it better to access any setting by going into the control panel and searching for it or just going into a single folder where all your options exist? Choose for yourself. Here are the other list of numbers that can enable all sorts of god modes in your Windows 7. Now in case of Vista the process is similar. The god mode started to work from Vista version alone. It doesn’t seem to work in the previous versions. But there is a story behind God mode. We know that it’s an Administrative shortcut. But we don’t know who actually developed it. Some say it’s a work by bloggers while the Microsoft Corporation still maintains it as a secret. So before enabling God mode in your Vista know about your OS, whether is it a 32 or 64 bit. This is necessary because, Vista 64-bit PC’s has been crashed after enabling Mode. But it is supported by Windows 7. So it’s advisable for Vista 64-bit OS not to enable the God Mode.